Wainwright's name is best known to Lake District walkers. As someone who fell in love with, and walked the fells of Cumbria, he led the way in encouraging others to follow in his footsteps. Through a series of seven books, Pictorial Guides, he encouraged other keen walkers to visit the fells through his eyes. Wainwright was not a native of the county, but was born nearby in Blackburn, Lancashire in 1907. His father was a stone mason. Due to poor financial circumstances, Wainwright quit school when only 13 years old and worked in an office. By happy circumstance he took a holiday at the age of 23 to the Lake District. While there, he climbed up Orrest Head in Windermere. This triggered his love affair with the fells of Lakeland. In 1941 he moved to Kendal. After this move, he began to climb the fells in earnest, gathering information that would later appear in his maps and books. His first book, The Eastern Fells, was published in 1952. 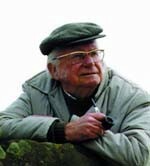 More than 20 years later, in 1966, he had written the seven guides which listed 214 fells with the details of his walks, maps, and sketches. When he died in 1991, he left behind a legacy not only in his books but also in the way the mountains are divided and referred to as the ‘Wainwright Fells’. Many walkers today aim to ‘bag’ the Wainwright Fells. Visit the church in Buttermere to see his memorial-his ashes are scattered on Haystacks, his favourite fell. Wainwright was chairman of Animal Rescue, Cumbria and donated royalties from his books to the charity. The Kendal museum contains a number of Wainwright's original pen and ink drawings. To purchase second-hand copies of his books visit Kirkland books in Kendal-they specialize in them. The Mountain section of our website contains photos of the fells.